Despite what my ex tells her friends, I hate repeating myself. And when it comes to managing a remote team and answering thousands of customer support questions every week, the last thing I want to do is answer the same question over and over again. Luckily for me, and my sanity, I found CloudApp. CloudApp is the coolest, sexiest, fastest way to explain and clarify your ideas or processes that we’ve ever come across. As easy as drag-n-drop!The AppSumo team is mildly obsessed with CloudApp. It’d be a big step backward for us to lose it. 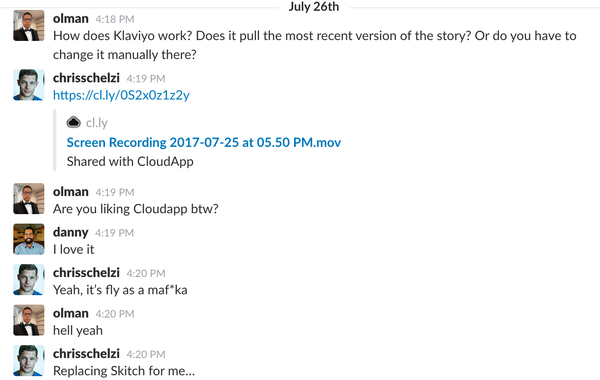 How’s the AppSumo team using CloudApp? Customer Support: Showing newbie Sumolings how to redeem deals. Copywriting: Marking up copy for editing. Marketing: Explaining changes to be made on landing pages. Design: Highlighting adjustments to be made on graphics. Onboarding: Recording video walkthroughs so people get up-to-speed on how we do things Sumo-Style. See! 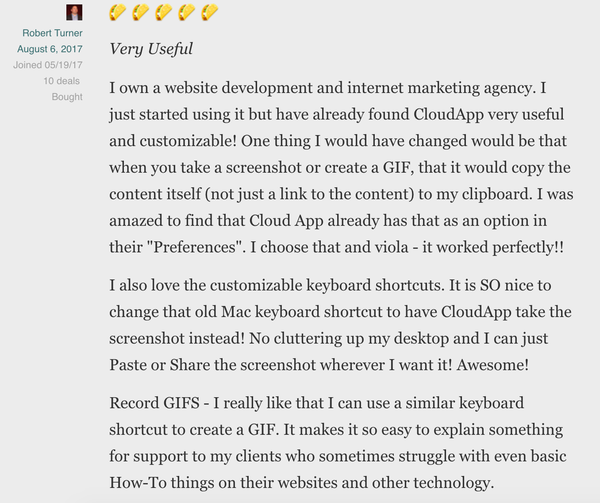 I’m not kidding!Here’s how easy CloudApp is to use! Save the link so you never have to repeat yourself again. Yay! You can even password protect any link to make sure unauthorized gremlins don’t find their way into your secure files. 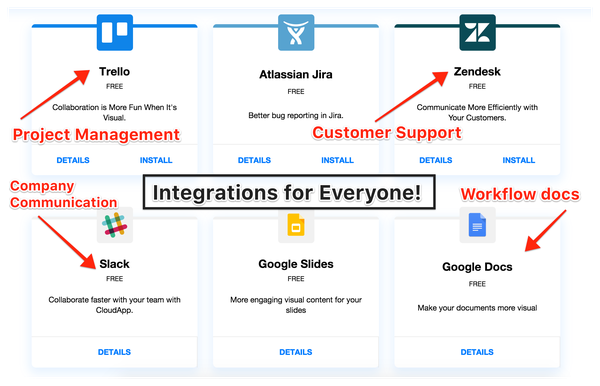 Pssst: I made this mock-up WITH CloudApp #Meta CloudApp works great with the tools you’re already using every day to manage your business!On a normal Taco-Tuesday you’d be paying $216/year for CloudApp’s Team Plan for 2 users. Considering this is one of our team’s MOST USED apps, we’d gladly pay that. Buuuuut you’re a Sumoling. Meaning you get special Sumoling pricing! So low, that you can forget having to pay a yearly price. Instead, you’ll be getting their TEAM plan for 2 users for only $39. And did I mention that it’s LIFETIME ACCESS? Because it is! I thought the same thing. Once I have a system that’s working, why disrupt that? Well, because CloudApp fixed problems that I didn’t even know I had with the free tools I was using. For one, as soon as I take a screenshot or video, it automatically syncs with the cloud, copies to my clipboard, and makes any captured text searchable! Pretty cool, right? Secondly, the annotation feature includes a bunch of tools that are missing from other programs, such as the spotlight function and even emojis! 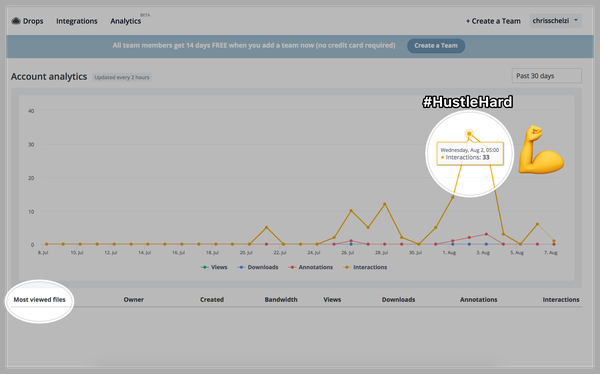 CloudApp even is boasting an analytics platform (currently in beta) that shows you where people are viewing your content, the referring domain, and the number of downloads! Unlimited Screenshots and Screen Recordings, cause ain’t nobody got time for deleting old photos. 1 Minute GIF Captures, which are perfect for explaining the little things. Unlimited File Storage, create and upload as many cat GIFs, screen recordings, and screenshots as you possibly can. Daily Bandwidth Limit is 4GB/day, make that sh*t go viral on Reddit and they’ll host it ALL day (at least up to 4GB worth). Password Protected Content, to keep your work safe from prying eyes. Secured Sharing, through your company’s CloudApp Organization. CloudApp is such an essential tool for any type of digital work that if it’s not in your arsenal, it needs to be. CloudApp is the Eminem of the productivity world. Don’t let Marshall down. Buy CloudApp and thank us later. Get Lifetime Access to the CloudApp Team Plan for $39! P.S. This deal is only for new accounts and free users looking to upgrade to CloudApp’s Team Plan.